Winter Cold or Winter Allergies? 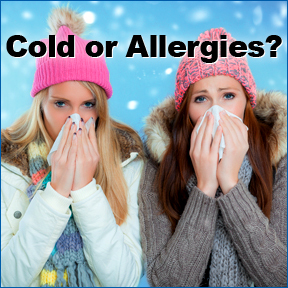 Posted on December 5, 2014 | Comments Off on Winter Cold or Winter Allergies? Many seasonal allergy sufferers are grateful when temperatures cool, as outdoor pollens and allergy triggers temporarily disappear. However, spending more time inside increases our exposure to indoor allergy triggers. Holiday foods, indoor festivities and holiday decorations can all trigger allergic responses, especially for those who may have sensitivities or asthma. Central heating, Christmas trees, overindulging in holiday foods and drinks and skimping on sleep may all cause reactions, which can contribute to asthmatic or allergic responses. Indoor allergens and pollutants can include irritants such as mold spores, dust mites, pet dander, household chemicals and smoke. Mold spores are especially hazardous as, unlike pollens, mold can grow anywhere and requires little more than moisture and oxygen to thrive. With additional time spent indoors, allergic individuals are more likely to suffer from symptoms that are often attributed to colds, such as runny nose, sinus irritation, sore throat, headache, fatigue and congestion. Both colds and allergies set off immune responses and, while many symptoms overlap, cold sufferers are more likely to have fever or body aches as opposed to itchy eyes or throat . Usually with colds, symptoms gradually get better within a week or so. If symptoms persist or are intermittent, allergens may be responsible. People who have allergies are more likely to develop asthma and those who have asthma may be particularly sensitive to indoor allergens. Insufficient sleep, eating too many sugary holiday treats and getting overexcited can also trigger asthma attacks. Knowing your triggers and limiting your exposure is one way to control winter allergies. Christmas trees are often blamed for an onset of allergy symptoms. While some may be sensitive to the strong scent of pine, others will be sensitive to pollen and microscopic mold spores that may be present on the tree and released into the air. If you have the time and the space, hosing down the tree and letting it dry outdoors before bringing it inside may help to reduce allergens. For those with sensitivities, limit the amount of time a live tree stays indoors to less than two weeks, or perhaps consider an artificial tree. Molds can be found indoors and out and are well known allergy triggers. Mold can hide in many indoor spaces, especially basements and bathrooms. Increasing ventilation in damp areas can help combat mold. If you store your holiday decorations in the basement, be sure they are stored in sealed containers and wash your hands thoroughly after moving any boxes. Firewood stored outdoors can also be mold contaminated, so wear gloves when bringing it inside and be aware that burning the wood indoors can trigger the release of airborne pollutants. Dust mites, microscopic allergy-inducing relatives of the spider, are known to live on mattresses, bedding, upholstered furniture, carpets and drapes. Stuffed animals can collect dust mites too, but they can be limited by placing unwashable favorites in a plastic bag and putting the bag in the freezer for a few hours each week. It’s unlikely that dust mites can be entirely eliminated but you can reduce their number by washing bedding in hot water once a week and, if you live in cold climates, you can leave non-washable bedding outside overnight to kill dust mites. Frequent vacuuming with a cleaner that has a HEPA filter can help to trap allergens. Those who are super sensitive should consider wearing a mask while vacuuming to reduce exposure to dust, dust mites and mold spores. Better yet, when possible, have someone without sensitivities do it for you. Animal dander can cause allergic reactions in people who have a reaction to the proteins found in dead skin cells that are shed by the animal. While we don’t want to leave our family pets out in the cold, there’s increased exposure to dander during winter months spent largely indoors. Bathing pets regularly often helps reduce allergens , as does keeping pets out of our bedrooms and especially our beds. Ideally, your pet should sleep in a less used area of the home. Although not recognized as an allergen, sugar invokes an inflammatory response and suppresses the immune system, so be wary of too many indulgent holiday treats if you want to stay healthy this winter. In addition, insufficient sleep can compromise the immune system, leaving us more susceptible to viruses and infections. Studies show that our amounts of killer T cells go down and inflammatory cytokines go up when we are sleep deprived, leaving us more susceptible to the pathogens that cause colds and flu. Continuing on with a healthy lifestyle during the holidays and reducing exposure to your known triggers is the best way to combat indoor allergies, hopefully enabling you to feel well enough to enjoy those holiday parties! Natural D-Hist by Ortho Molecular – This very popular product provides natural relief of allergy discomfort with carefully selected nutrients. The formula contains anti-inflammatories, antioxidants and flavonoids, which help to manage histamine levels, support natural antioxidant activity and support sinus, nasal passage and respiratory health. Gluten, soy, corn, and yeast free. D-Hist Jr. by Ortho Molecular, formulated especially for children, provides relief from seasonal allergy discomfort in an easy to take lemon-lime flavored chewable tablet. Gluten, soy and yeast free. No artificial colors or flavors. Allergy Response by Innate Response Formulas – This product supports healthy allergy and inflammatory responses and helps stabilize histamine release with vitamin C, quercetin and nettle leaf extract. Gluten, soy, dairy, sugar and corn free formula. Immune Support Packets by Designs for Health – These individual packets provide antibacterial and antiviral support with a comprehensive arsenal of immune supportive herbs and nutrients, which aid in building a strong immune defense during cold and flu season. 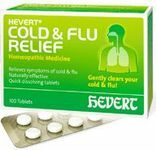 Hevert Cold & Flu Relief by Hevert Pharmaceuticals – This product provides homeopathic support for the temporary relief of cold and flu symptoms. This formula will not cause drowsiness and contains no artificial ingredients. Formulated for adults and children over 6 years of age. This entry was posted in Home and tagged Allergy Response by Innate Response Formulas, D-Hist Jr. by Ortho Molecular, Hevert Cold & Flu Relief by Hevert Pharmaceuticals, Immune Support Packets by Designs For Health, Natural D-Hist by Ortho Molecular, Winter Allergies, Winter Cold. Bookmark the permalink.